Ford Model Daniel Duboy for Huf Magazine. 2014 VMAs. I painted the solid white dancer for Beyonce. Her performance begins with that dancer in her lap. 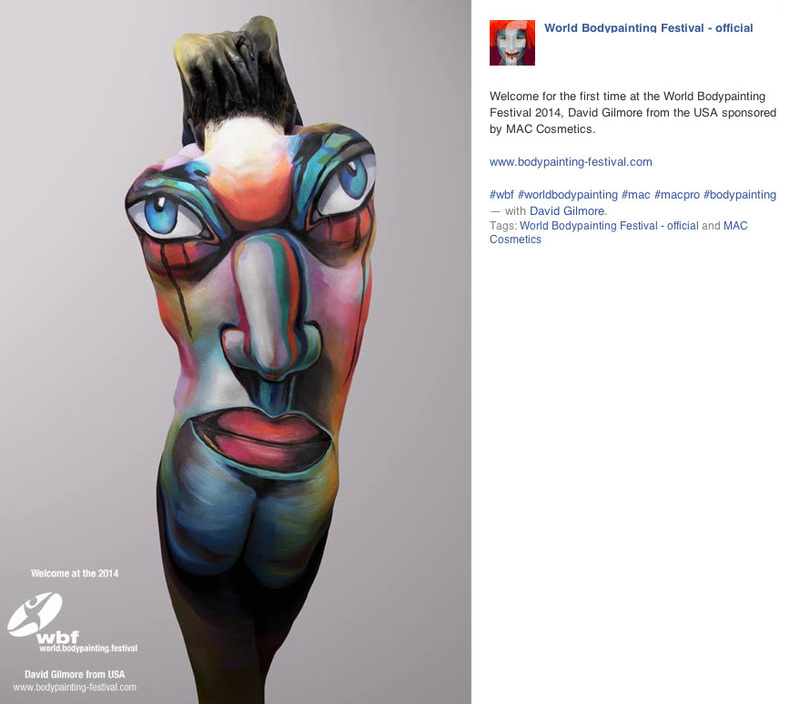 Attended the World Body Painting Festival in Austria July 2014 as the sponsored artist of MAC Cosmetics. Article on my artwork appeared in the July 2014 issue of The Fight Magazine. My body on the cover of and spread inside Numero Magzine July 2014 Art Issue. Surfboard I painted won best in show at The Board Room Show in Del Mar, CA May 2014. 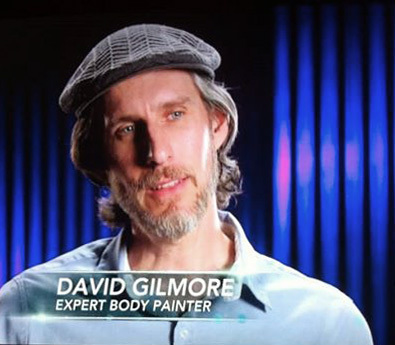 On Nov 19, 2013, I was one of five body paint experts profiled for an hour show on the SYFY Network titled, "Naked and Painted." Won the Belmont Shore sidewalk chalk art contest on Oct. 19, 2013. Final drawing and very nicely, someone bought it right there. On Makeup Magazine Fall 2013. Seven illustration appeared. On Makeup Magazine Fall 2013. 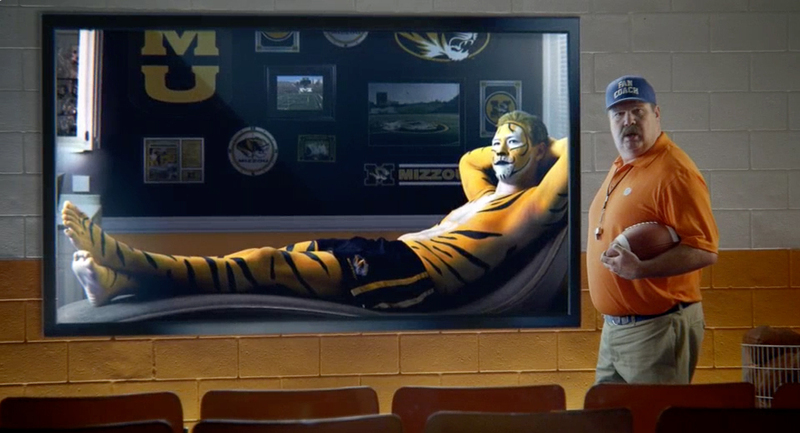 AT&T commercial that airs during college football called #bethefan starring Eric Stonestreet from Modern Family. For product I used: MAC acrylics and chromacake. 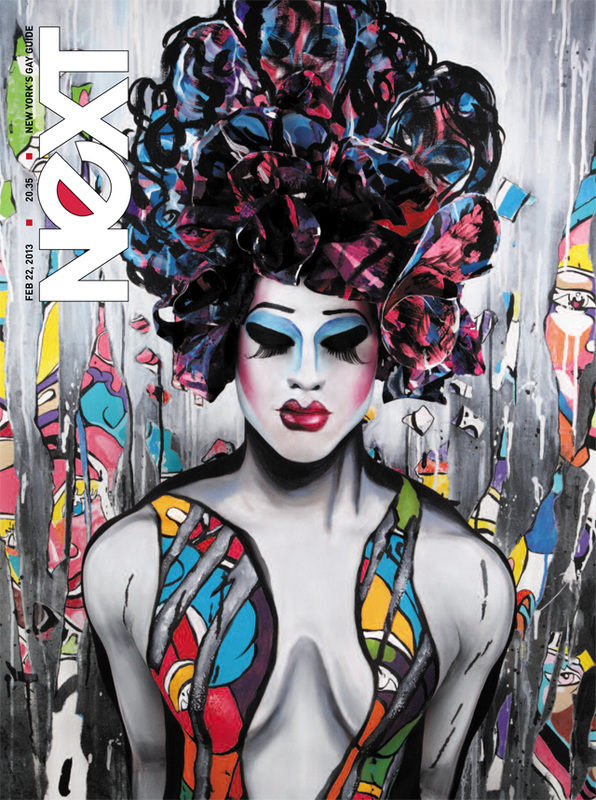 My body art and photography on the cover of Next Magazine. Male model body painted to look like a lovely lady. He's wearing a paper flower headdress standing in front of a backdrop I created. 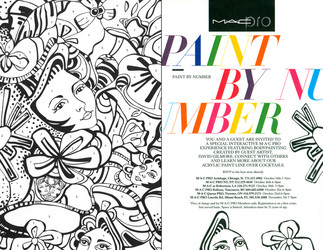 Paint By Number featuring me for MAC cosmetics. I created all the artwork for this traveling event including the cover of the invite and what will be painted on the model. I will be in the following cities: Chicago, NYC, LA, Vancouver, Toronto, and Miami. 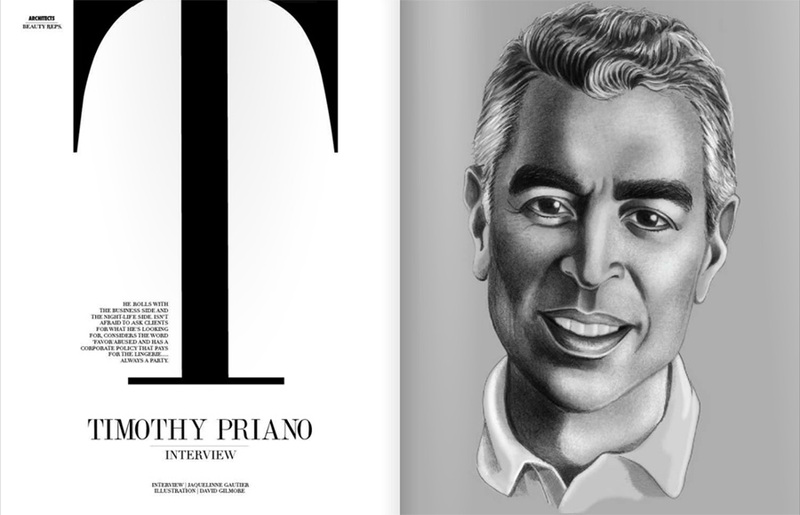 Illustration of agent Timothy Priano in Idoll Magazine. A year ago I body painted tennis star Jan-Michael Gambill with a large HIV awareness ribbon across his torso (his concept) as well another look. The photos were gifts for his good friend Elton John and now those pieces are a part of EJ's collection. An article in the Spokesman-Review newspaper did a write-up on him and used our photo. Spokane is the city where Jan-Michael is from. 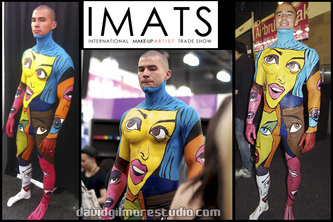 Closeup look at my June 24th body paint for MAC Cosmetics at the LA IMATS. 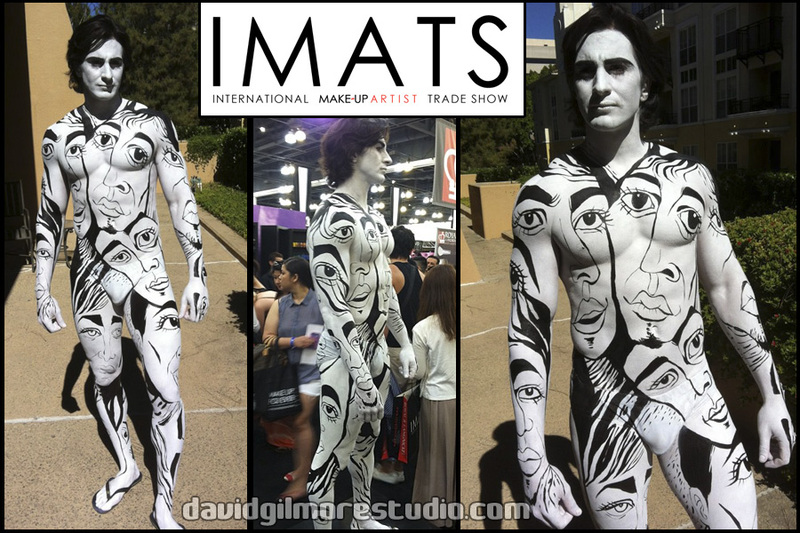 Closeup look at my June 23th body paint for MAC Cosmetics at the LA IMATS. Tia & Tamera on The Style Network. Painted a mural in Tamera Mowery's nursery. My body painting for MAC Cosmetics at the LA IMATS appeared in the August issue of Make-Up Artist Magazine. Recently received Andy Cohen's "Mazel" on his Watch What Happens Live show on Bravo. 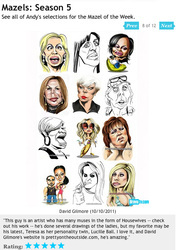 An image gallery of my "bravo-lebrities" appears on their site. 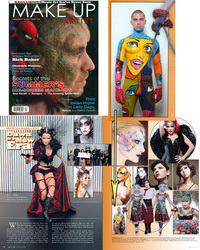 ON MAKEUP magazine did a six page profile of my Anime body painting. An illustration of Lady GaGa for ON MAKEUP magazine spring 2011. Painted murals in Mariah Carey's LA and NYC homes. Even painted her beautiful baby bump. This article appeared in Life & Style magazine. 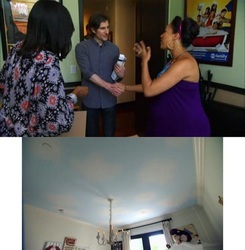 Painted a mural in Mariah Carey's nursery which was featured in Life & Style Magazine's May 2, 2011 issue. Painted a mural in a show unit in The Evo Tower in downtown LA. 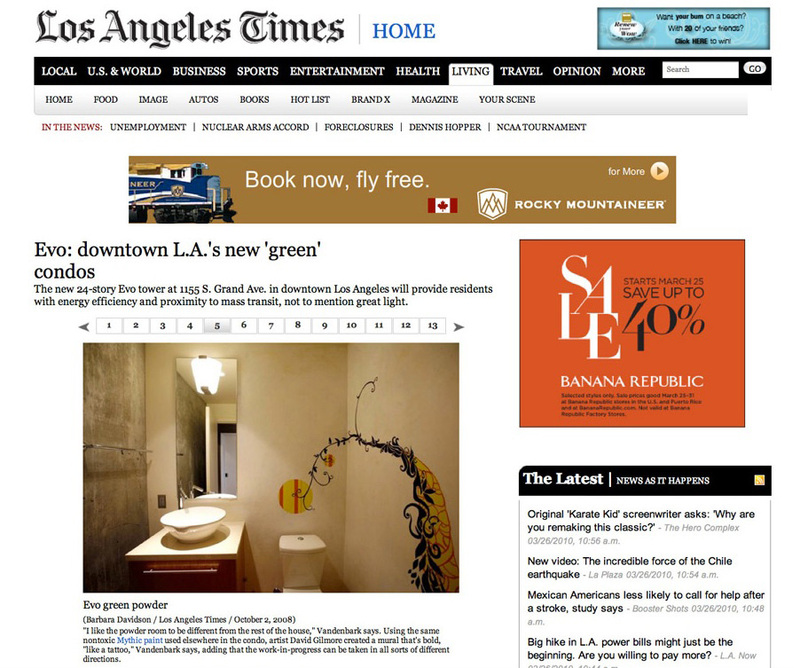 This was featured in The Los Angeles Times online October 2, 2008. 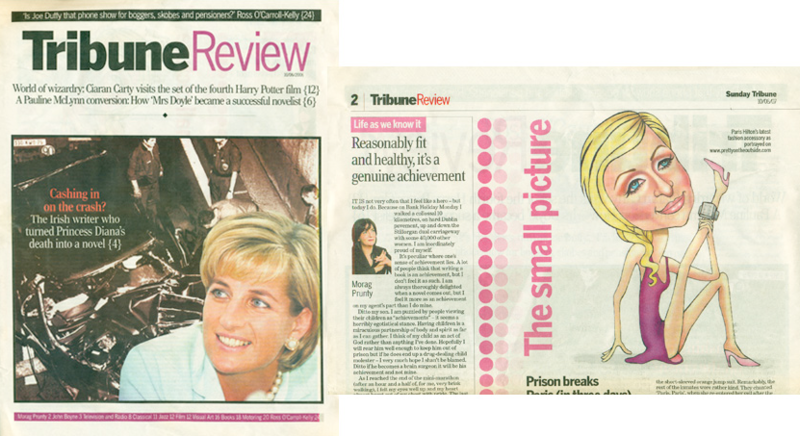 Created an illustration of Paris Hilton for the Irish Tribune Review. Created an illustration of Paris Hilton for YAM! Magazine. It's the German equivalent of People Magazine. Created an illustration of Lindsay Lohan for YAM! Magazine. It's the German equivalent of People Magazine. "BOYBOT" body paint for the cover of Icarus. Body paint on the cover of Icarus magazine. Gambill and gifted to Elton John and have been officially added in his collection. Episode of Tia and Tamera on The Style Network. Painted a mural on Tamera Mowery’s ceiling. Snow Flower Ice. 4260 Lincoln Blvd. Marina del Rey, CA. Entrance mural in shaved ice business. Original design. Zappos sponsored mural at the corner of 6th and Serrano in Koreatown. LA, CA. This is part of a 10 city, 10 mural project. 10 days to complete. August 2016. Client hired me to create a scrolling geometric pattern which covers three side of the building. 10 days to complete. Completed September 2016. Utility Box on the corner of 4th and Pacific in Long Beach, CA paid for the mayor's office. Have painted at least 60 + murals in homes in Seattle, NYC, Los Gatos, Ventura, LA and Orange counties over the last 14 years. Projects vary in scale from smaller one-day ventures to massive 60 day long murals which travel over several walls. Painted a mural on Tamera Mowery's nursery ceiling for her reality TV show Tia & Tamera. 2012. My artwork appeared in Transproofed, a film by David Maurice Gil. 2009. 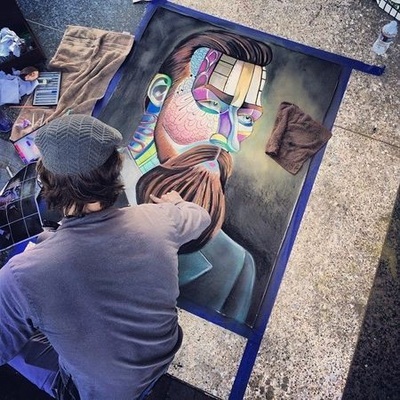 Long Beach Chalk Art Contest. 1rst Place in the Belmont Shore, CA sidewalk chalk art contest 2014. 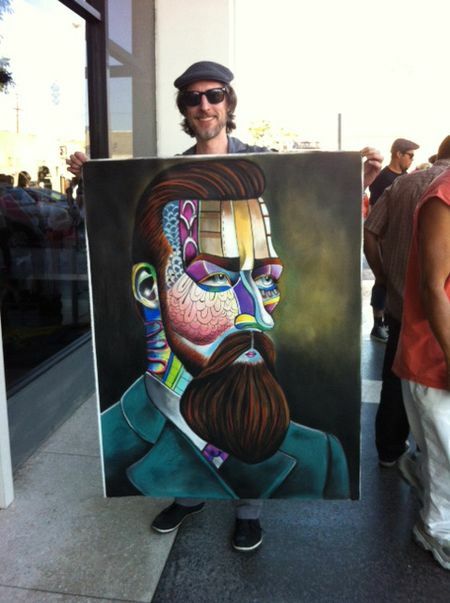 Won the Belmont Shore, CA sidewalk chalk art contest 2013. 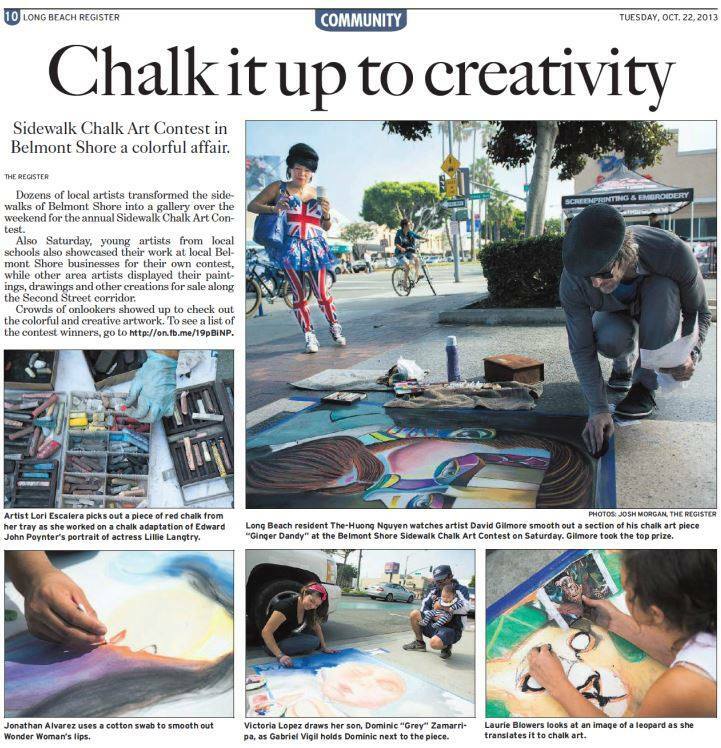 Won the Belmont Shore, CA sidewalk chalk art contest in 2009 (pictured below) and came in 2nd place in 2008. Gallery ML, Philadelphia, PA. Had five pieces in group show. 2011. Gallery ML, Philadelphia, PA. 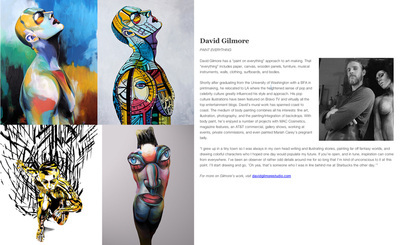 Featured artist in show. 2011. Set design for Royce Multimedia Irvine, CA 2011. Laura Mercier event at The London Hotel in West Hollywood, CA where I hand painted makeup containers to look like macaroons. Hand painted 100 containers with rsvp'd guests names and then hand embellished those makeup containers at the event. 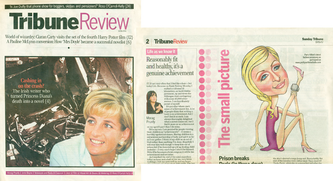 Both from 1999 to 2001. 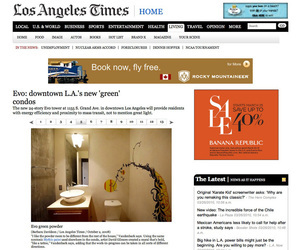 Clients included: Absolut Vodka, BIC, Orbitz,com, Circuit City, and a variety of web-based glamor sites. My blog Pretty On The Outside.com began in Nov. 2006 to present. Bravo.com, Huffington Post, TMZ.com, NPR blog, Perez Hitlon, Dlisted, Pink Is The New Blog, Towleroad, Oh La La Mag, Kenneth In The 212, After Elton, La Rag Mag, What Would Tyler Durden Do, Just Jared, Socialite Life, Gawker, Defamer, Blogging Project Runway, Popsugar, Pajiba, I’m Not Obsessed, Celebitchy and many more. Illustrated/ designed a 13’ x 19‘ backdrop for Mexican Pop singer Paulina Rubio’s international Gran City Pop tour 2009. 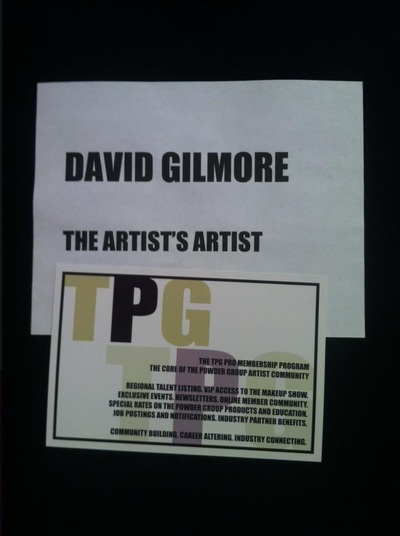 Logo Design for a TV pilot through Royce Multimedia Irvine, CA 2010. Storyboard designs for Royce Multimedia recurring projects 2010 to 2011. 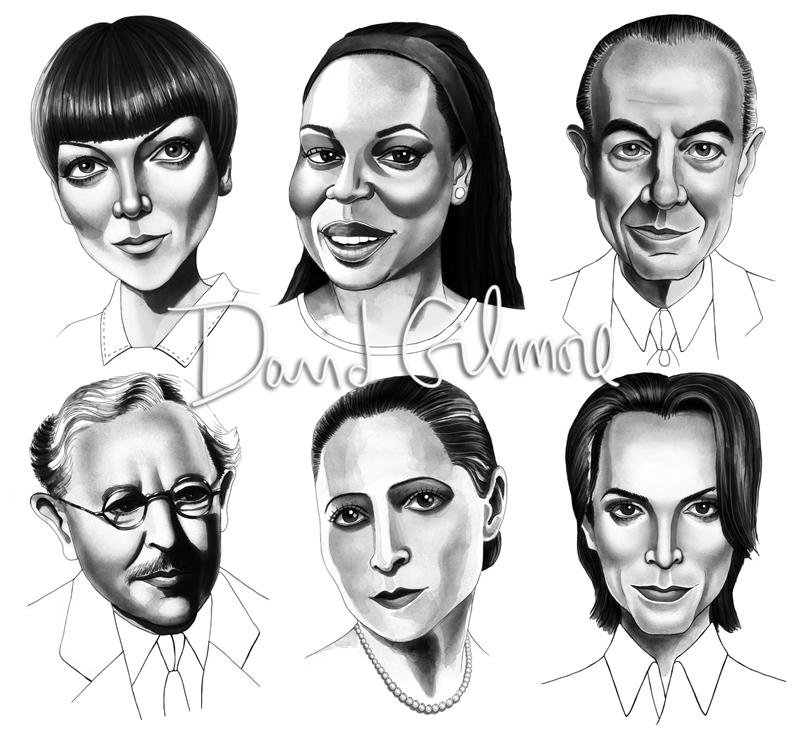 Illustrated all the editors and writers for Gawker.com. 2011. Received Andy Cohen's "Mazel" on his Watch What Happen's Bravo show and a gallery of my bravo-lebrity illustrations appear on Bravo's site. 2011. 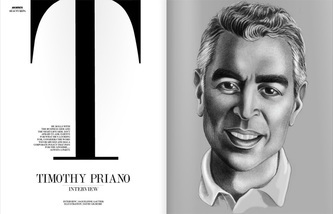 An illustration of agent Timothy Priano appeared in Idoll Magazine. 2012. January 2019. 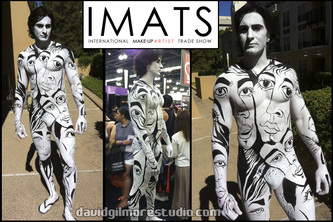 IMATS LA, CA. Client: Royal and LangNickel. Oct. 2018. Private party for blogger Just Jared in LA, CA. with Asher Entertainment. Oct. 2018 NYX Cosmetics private event for influencers. Sept. Step Up and Dance body paint on two dancers for Todrick Hall in Atlanta, GA.
Nat Geo Event in NYC, Two nights in two locations . Body painted four models with two assistants. ​Private Event in LA, CA . Body painted two models. April 13th, 2018 For Asher Entertainment. 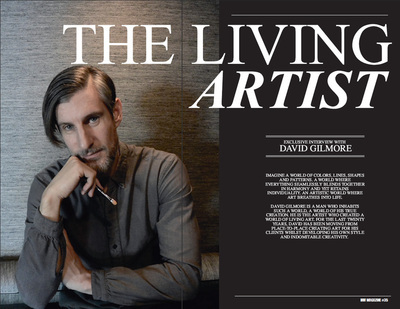 January 2015 Feature in Huf Magazine. 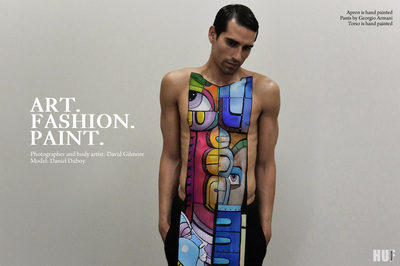 Body Painted Ford model Daniel Duboy. Oct. 2015 Painted model Rodiney Santiago at the Shop LASC in West Hollywood at a live event during the Weho Halloween festival. Client: European Body Art. Oct 2015. Joint project with pop star Selena Gomez and Instagram itself which was shared by both and many other sites. Body painted a model and Selena joined in the fun. Oct. 2014 Ted 2. Two day body painting. 2014 VMAs. Featured dancer for Beyonce. That dancer begins Beyonce’s segment resting in her lap. June 2014 Cover plus eight page spread in Numero Magazine of my body painting on supermodel and face of Estee Lauder Constance Jablonski. SyFy Network. I was one of five body paint experts profiled in a one hour special titled “Naked and Painted.” July 2013. AT&T Commercial #bethefan starring Eric Stonestreet from Modern family. Painted a football fan to look like a tiger. September 2013. Sami Beigi music video. Painted featured dancer. July 2013. Guest artist on a mentoring panel for upcoming makeup artists for The Powder Group at The Makeup Show in LA. March 2, 2013. Cover of NEXT Magazine February 2013 featuring my body paint and photography. Painted Tennis star Jan-Michael Gambill with a large HIV awareness ribbon across his torso and the final photograph was given to his good friend Elton John. That photo appeared in Jan-Michael’s home town newspaper, The Spokeman Review in Spokane, WA. 2012 There were two looks from this shoot we did and both photos are currently in Elton John’s art archives. Paint By Number. Six city travelling body painting event I did with MAC Cosmetics. 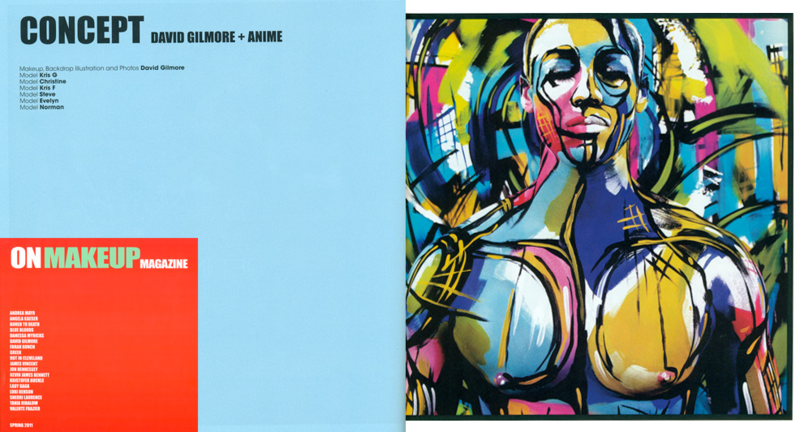 My original artwork was used for the: flyer, backdrop, and body paint design. This project took me to: NYC, LA, Chicago, Vancouver,Toronto, and Miami. Chroma Coalition August 2012. One of six featured body painters in LA, CA. 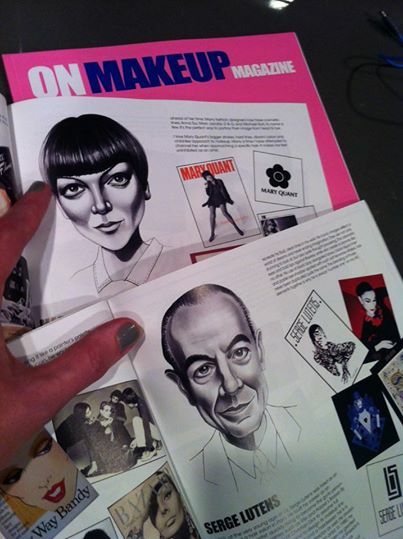 IMATS Makeup featured in August 2012 issue of Make-Up Artist Magazine. July 2012, Part of a team of body painters who painted Chris Brown’s backup dancers at the BET Awards in LA, CA. 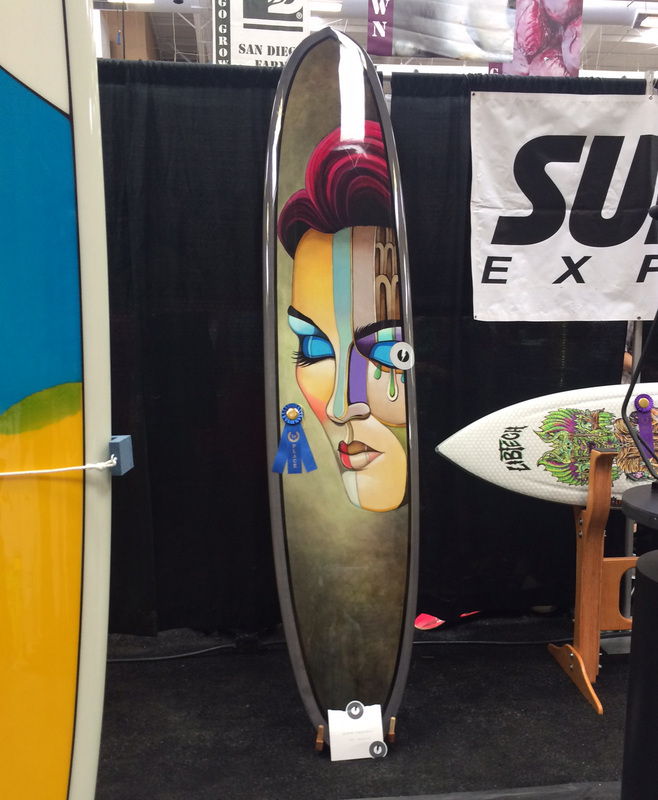 Lead artist: Tyson Fountaine. LA IMATS. International Makeup Artist Trade Show. 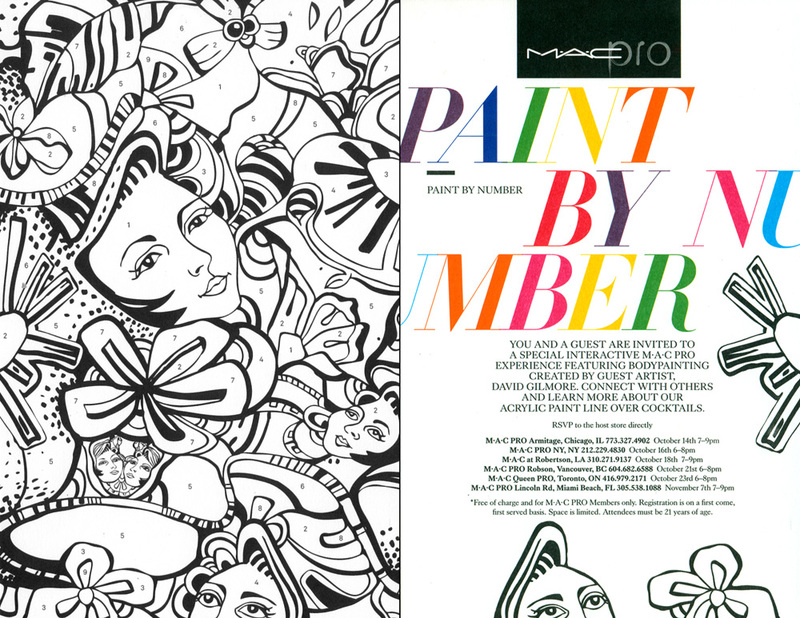 Two days body painting my original designs for MAC Cosmetics. June 2012. Painted Mariah Carey’s 8 month pregnant belly for Life&Style Magazine. April 2012. On Makeup Magazine. 6 page profile of my anime body paint. July 2011. 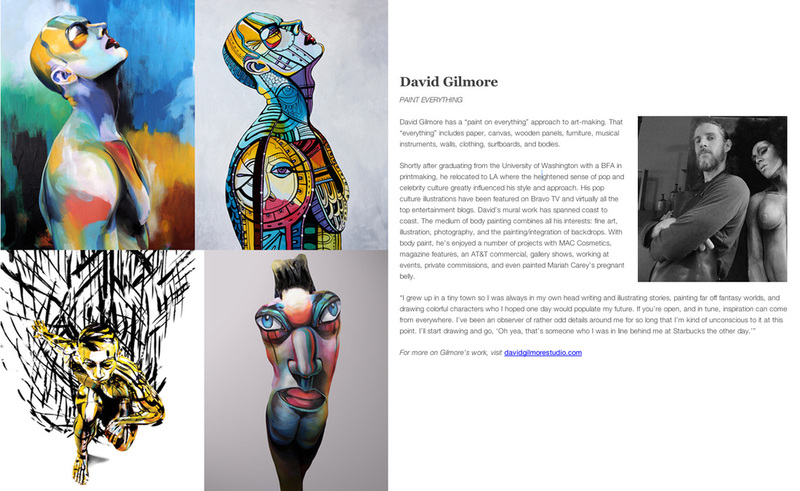 A majority of my body paint work is privately commissioned (a lot like my mural and portrait work.) A large number are: maternity and couples as well as for private individuals.